Slated to be one of most refined and strongest collection yet - comes our Peranakan Flower. Our previous Choo Yilin Peranakan-inspired collection was released several years to much acclaim and till date - remains one of our fan favourites. Their ostentatious designs, eye-catching gemstones, and glamorous aesthetic makes for the perfect statement jewellery piece to your treasure chest. This post brings you behind every intricate filigree and painstaking hand-crafted milgrain featured in these opulent Peranakan Flower pieces as we uncover how these beloved heritage baubles were curated and lovingly hand-made. Behind the scenes of picking amongst a wide array of gemstones. Beginning with a simple idea - to immortalise our beloved heritage icons into stunning fine jewellery for keeps through the years. For this collection, we sought to bring a new addition to our Peranakan repertoire taking inspiration from their Nyonya Kebaya. Every little detail counts, when it comes to designing jewelry. 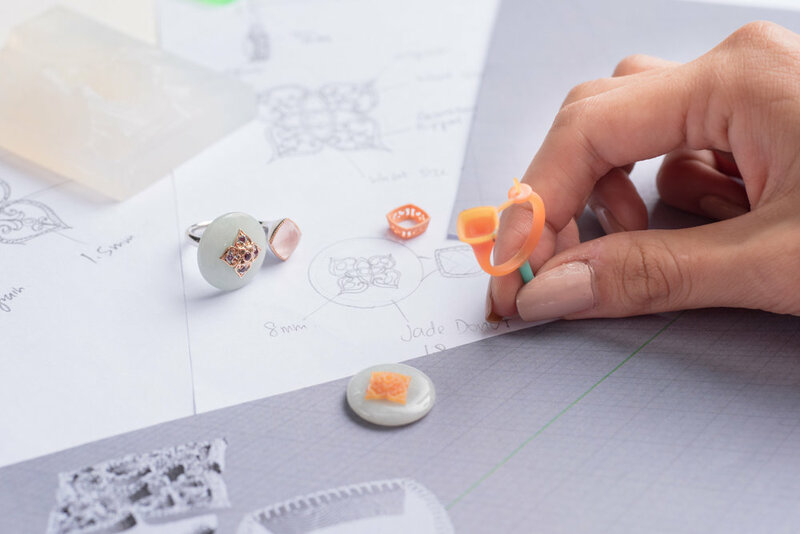 From sketching to the prototyping of the motif, to make the perfect piece of jewelry. Akin to the dedication and commitment to the traditionally hand-sewn embroidery work - the making of this Peranakan Flower collection features just as much backbreaking effort and time to produce. Numerous rounds of samples were failed and discarded before our one Eureka moment - for the perfect motif bearing all the intricacies we had envisioned and hoped for. It was a Choo Yilin personal best in the office as well as one for our artisans in the workshop. This beautiful collection is a true testament to their dedication towards the craftmanship and skills behind fine jewellery making. The Peranakan Flower Open-Ended Ring in the making. It is hard to encapsulate fine details into jewellery due to their complex processes - likewise, it's difficult for us to adequately communicate the roller-coaster of happiness, frustration, relief, and apprehension that went on behind the scenes during this collection. Nonetheless, it's our greatest joy to be able to (finally) present you our Peranakan Flower collection and simply ask for your kind appreciation - to our long nights, our failed samples, our artisan's skills, and above all - our beautiful fine jewellery. Lovingly made and harshly critiqued, every step of the way, by the team at Choo Yilin for You.